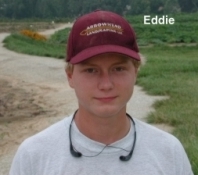 Eddie worked at Lakeview Farms a very long time-- from 1997 to 2002. Eddie was a relatively low key individual but had a gift for summarizing a situation in a few succinct words. I have always had the utmost confidence and trust in Eddie over the years and even gave him a couple of drawers full of cash and asking him to handle what I thought would be a slow strawberry Saturday weekend in early May when I was attending my daughter's graduation at Texas A&M. It turned out to be a much busier day than anyone expected but Eddie handled it just fine. While Eddie was super dependable and well liked by every one who worked with him, he had a propensity to usually arrive at work slightly after the normal starting time. When Eddie was younger and not driving he told me it was his mother who always ran late. But later on, when he was driving himself, the result was the same. So that's how Eddie got the "fast Eddie" moniker.